I cannot even locate the ‘before’ photos. And I know I have them. Somewhere. Sigh. I picked these up a year ago this past summer and have been moving them around in the garage waiting for both inspiration to strike and some free time. The middle of November found me done with my professional contract and now having time. The ultimate goal was to clear out the small garage stall in order to bed my sports car down for the winter and these chairs were currently taking up a lot of space. I had moved them to the larger side of the garage and I had lined them up, hoping for some inspiration. What happened was they were bumped around until them ended up out of line and that is exactly when I got my idea. A curved bench. This was way into the process – almost done, in fact, but you can see what I mean about filling in the gaps between the chairs. The front of the chairs actually touch, so I used a couple of metal straps to attach them. Then came the process of creating the seat. 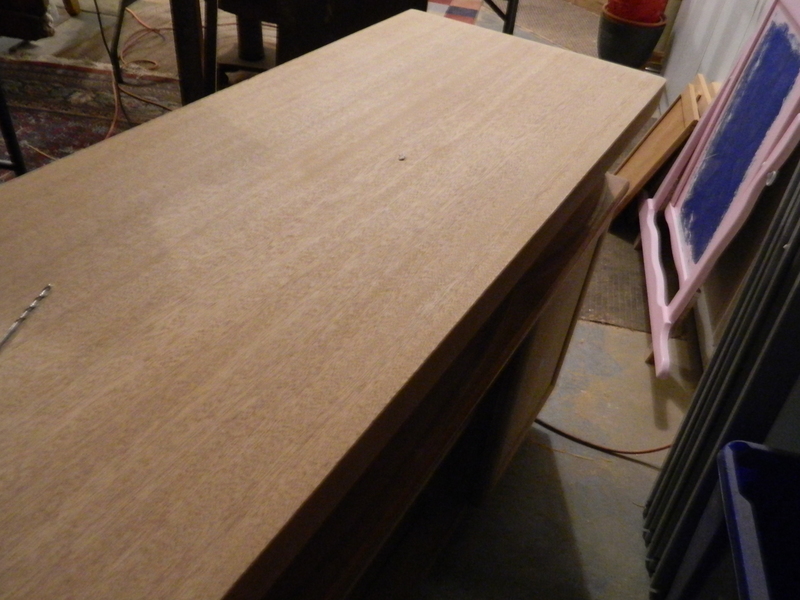 I started with two 12″ wide boards which were glued and joined together. I placed the original seats into their original location and then laid a scrap piece of wood across them and screwed them into place. 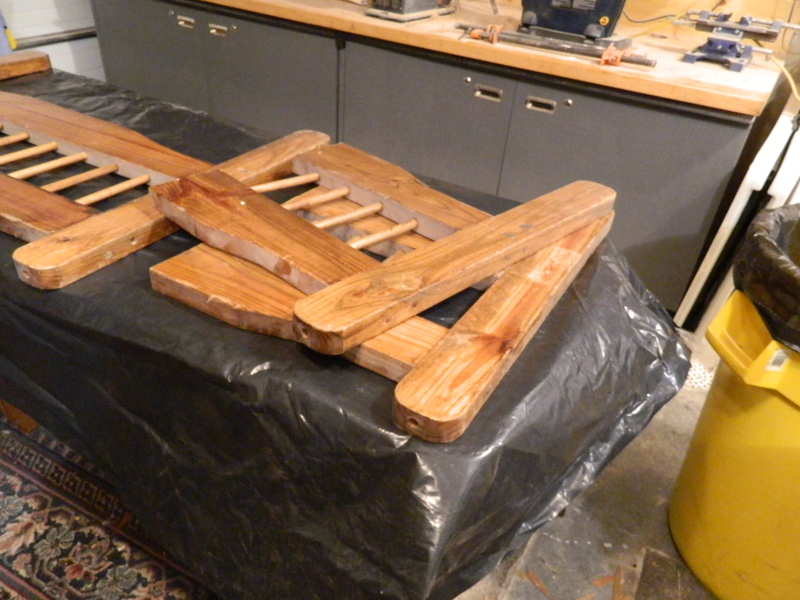 Then I placed that assembly onto the wood prepared for the new seat. I then traced around the seats so I would know where to cut. It did take a little finagling to get the new board into place but it eventually got there. Then I made a line on the front and sides, allowing for about an inch overhang. I kind of do this with guesswork and experience from other projects. I also like a little extra to allow for sanding and possible re-cuts. The Kid then gave it a nice rounded edge using the router, and then it was a matter of sanding all the edges smooth as well as the seat top. I didn’t worry too much about the underside, since it wouldn’t be seen. It was given three coats of a medium/medium dark stain. To help protect it from the elements, it was given not just two or three coats of polyurethane, but five! This included the actual chairs as well. While there is some protection from the elements on my “porch”, it is outside and I’d like to last for a while. Then it was just a matter of placing the seat back onto the chairs assembly and using the original screw holes, attach it nice and firmly. Viola! It was moved into place and we were done! Now, I don’t claim to be an expert, I am more like my Dad who just tried things and learned what works and what doesn’t. I am not a stickler for the details, so don’t look too closely! 🙂 There are places where just a little more level or a little less sanding might have added to the overall project, but I like how it turns out and that is what matters! You can see that the door has faded… come next spring, that is on the list! You can see the slight curve of the seat… I wanted something different from what everyone else does and I like how this worked. For the seat, pine was chosen for the 1″x12″ boards. You can kind of see where the saturation of the stain soaked dark on the edges and where I missed cleaning off all the glue on the seat. But that is what makes it unique and special. The front entry has a tiled ‘floor’, which i did when I first moved in. It gets slick in the winter from water, ice and snow, so we put down nice mats to prevent falls. By the way, I still have the four original seats and desk writing arms which are from a very nice solid hardwood. If you have ideas on what I could do with these, I am all ears! I picked up this little vintage bench a while back and it sat in the garage for a while before I got around to working on it. But once I started it went pretty quickly. I just can’t believe that I had forgotten to write it up. I had uploaded all the photos, just didn’t get the text written! How the heck did that happen? 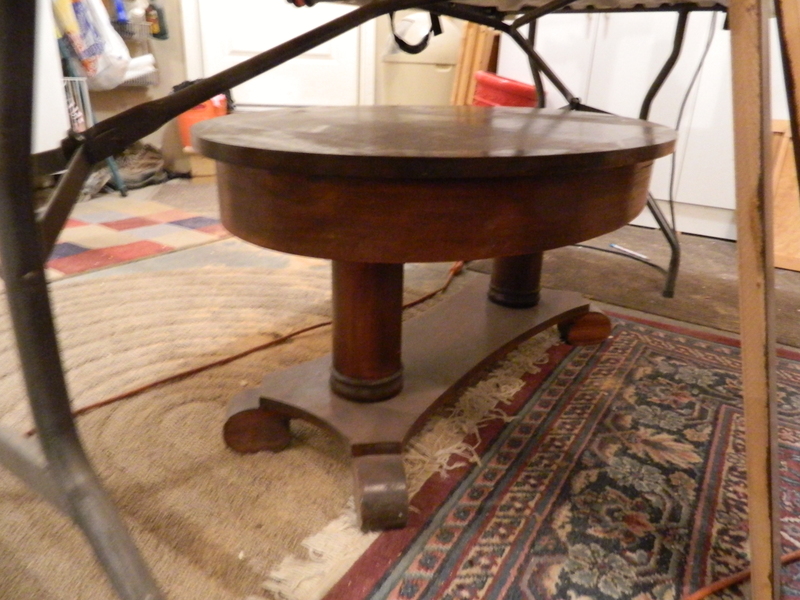 Originally, I hoped to restore the bench, but the top was just too damaged and stained. And it probably was a saving grace, as while taking it apart, I found that it had been stuffed with horse hair and old newspapers. And it smelled pretty bad. So, 4 inch thick green foam replaced the stinky newspapers and horse hair. I first laid a sheet of wood across the top. All of it was painted with a beautiful deep metallic brown paint. I just love the way it sets off the carvings. I was in the middle of harvesting denim from old blue jeans and opted to go that direction. I carefully dissembled a couple of pairs of jeans that were similar in color to use in covering the bench. Using a pneumatic stapler, I then laid the denim over the bench, pulled taught and stapled. I couldn’t find any belts the same – either color or style. So I found about a half dozen leather belts that were very close in style, so I opted to spray paint them the same color as the base. The leather took the paint very well and was even malleable enough to get wrapped around the bench. I even kept the belt buckles! 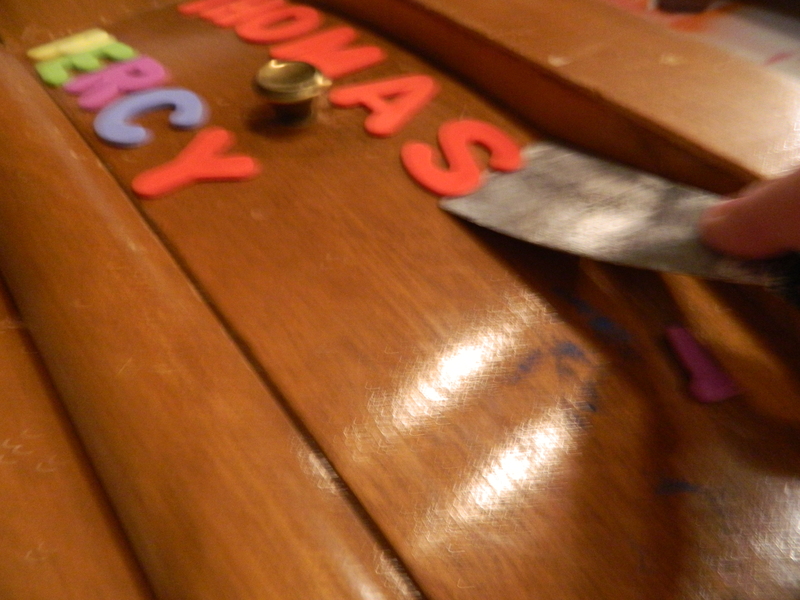 From there, it was simply a quick tacking over a base of glue. And there it is. Another project completed. 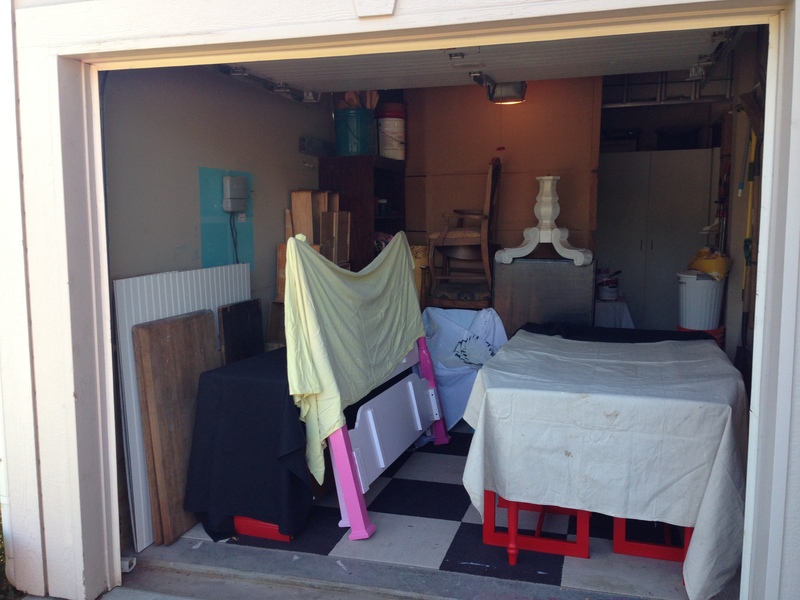 I am determined to get these projects done so that I have room in the garage for at least two cars this winter! And since fall arrived this week, winter is just around the corner! Why Are The Weekends Always Too Short? This weekend was really about simply making progress on about a half dozen big projects. I am never amazed at the never-ending supply of great ideas and the things that inspire them. This next project was sparked by a lively conversation with a wonderful co-worker. She has the words “Inside Voice” written on the white board in her office and we got to talking about it. Trust me to say that she is not the only person who needs to be reminded that cubicles are not the same as walled offices and voices travel. Mine included! So, I searched the internet and found a couple of compositions that might work well for a cross stitch pillow she can lean against the bottom of her monitor to remind her. I can’t quite decide which one I am going with, just yet. I know the colors and have a scrap pieces of fabric I used in making a suitcase dresser and I still have to get enough thread so that I don’t run out. Either one I use will require a ton for the background, so I am going to lay in a good supply. Lastly, I also had this little chair that I remade for my sewing room. Simple again in design… just painted the frame of an old chair given to me and recover the seat. The green looks more ‘limey’ than it really is, the lighting in the room made it look like this! Okay, back to work tomorrow! I have three days of training in anticipation of me taking over the training, so I really have to be paying attention! No way can I afford to doze off in these classes! 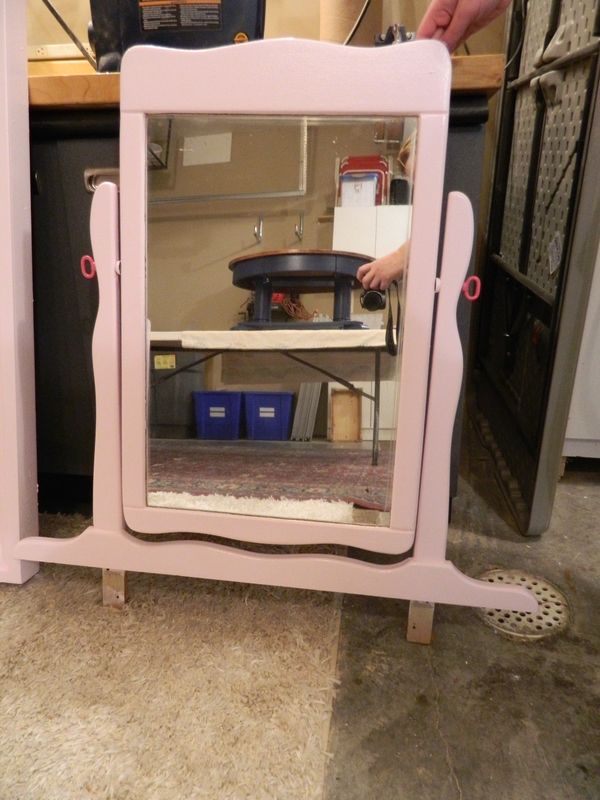 Antique Wardrobe: Once Again in Pinks! I stumbled across another site in which to buy great pieces of furniture for cheap: MacsBid. I think they’re rather new and as such, you can still get great things for little money. They are local to the Kansas City area, so apologies if you cannot take advantage of this site. 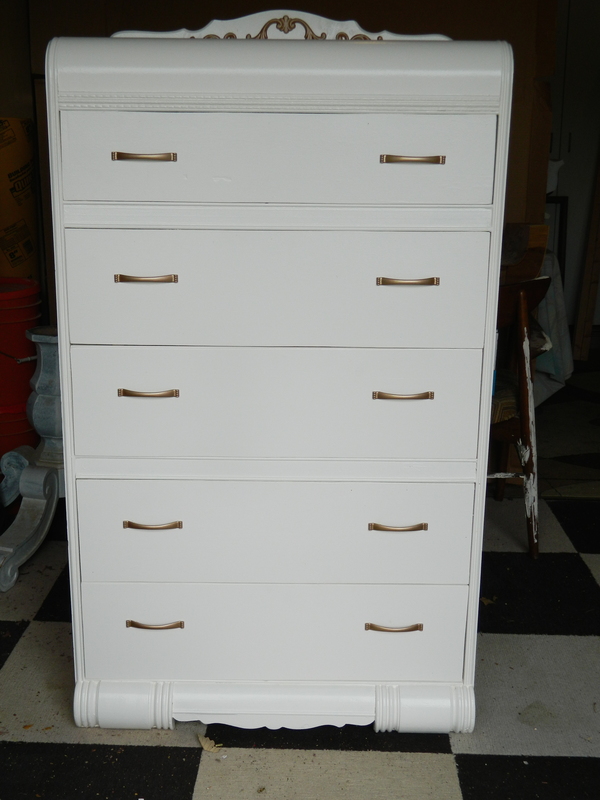 A few weeks ago, I bid on and won this great old wardrobe/dresser piece. Even from just the photos (they do schedule a day for inspection) I could tell this would be a great piece to re-do. As with most pieces of this age, there were issues with the veneer, but I am fairly experienced to handling that. On the up side, the interior of the hanging portion was lined with cedar and looked to be lightly used. Structurally, it was solid, the drawer guides needed a little love but that was it. I removed the drawers and the door and its hardware. I taped off the door edges because I knew I wanted to maintain the interior of the wardrobe section. I then started stripping away any loose veneer and then sanding the areas. I filled in the deeper sections with wood filler and followed with sanding. Lots of sanding! I also had to glue and clamp the trim between the wardrobe and the drawers… its expected that over time moisture and then heat will weaken or dissolve wood glue. There was lots of sanding and I applied wood filler where and when needed. My arms got a real workout even with an electric sander! 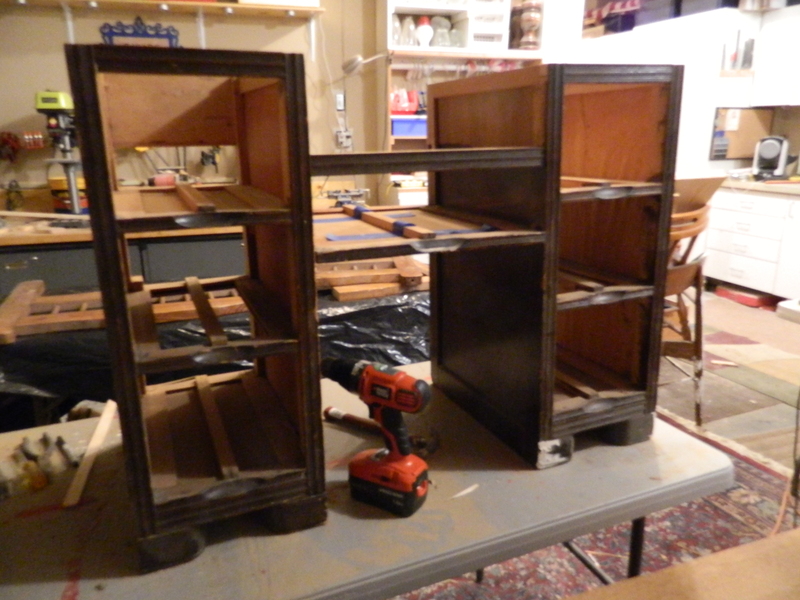 I also sanded all the surfaces lightly to achieve the best paint adhesion, including the drawers and door front. 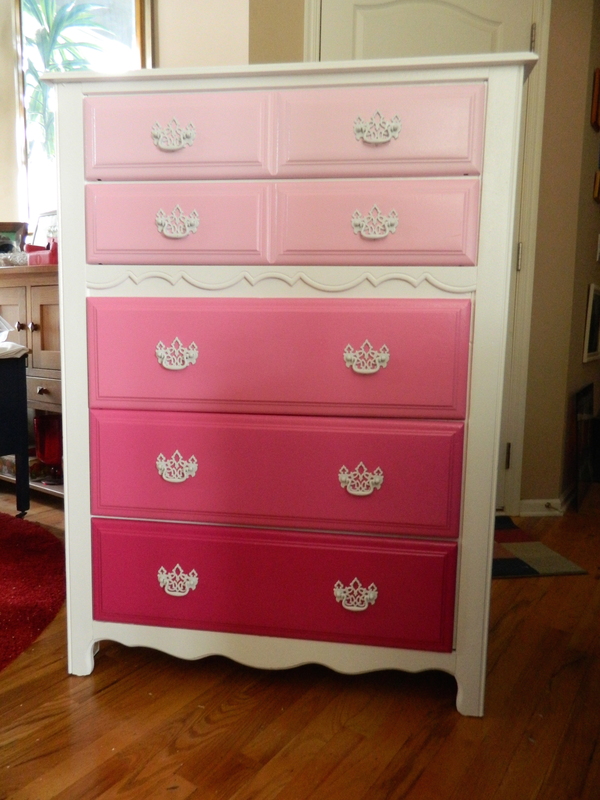 Out came my signature pink paints: the door was color one and then the drawers in order. 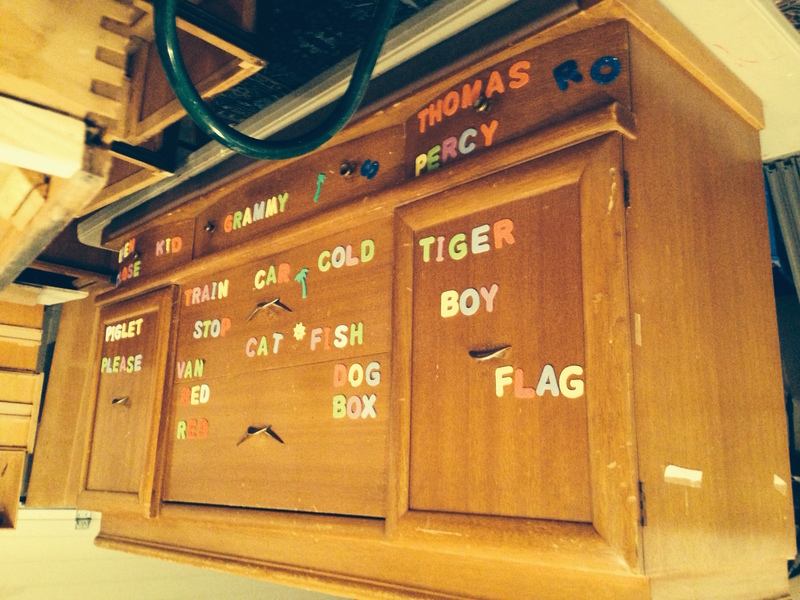 The cabinet was so thirsty that it took nearly six coats of paint to get good saturation and even coverage. I used the original hinges, just spray painted them silver (originally brass) and then added these adorable flower petal handles (using original holes). 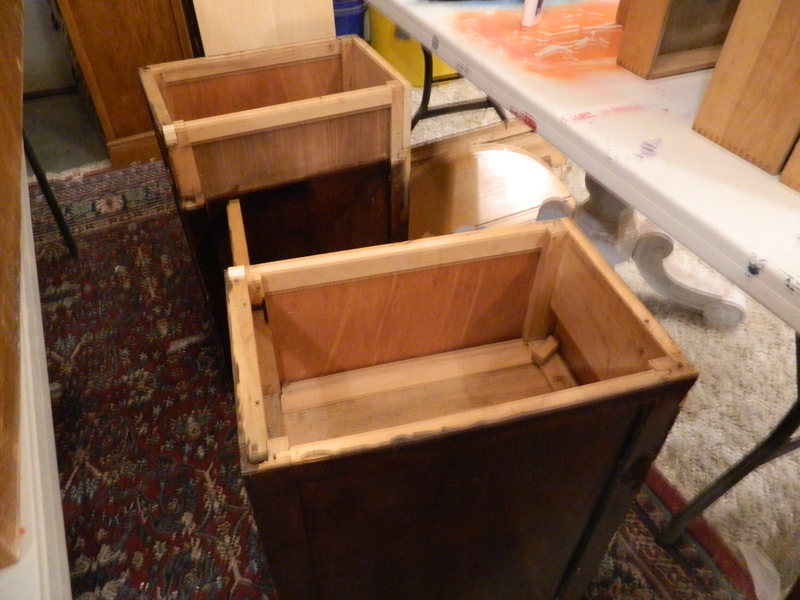 There was a little adjusting necessary with the drawers, sometimes painting will add moisture and the wood will expand. We simply planed bottoms to preserve the recent painting and they slide quite nicely. The only thing left is to sell and deliver it to some lucky little (or not so little) girl who loves pink! Tomorrow marks a slight change in my activities, I am heading back to full time work after being on sabbatical (and recovery from my knee surgeries) for the past fifteen months so once again my creative work will become a little less constant. Although I’ve already two more projects to show you and I’ve been steadily working on both the hand quilting of my ‘found’ quilt and that large needlepoint that I begun oh so long ago! I also have tomatoes started on the deck and this year I am growing potatoes in a barrel! Never a dull moment around here! So I managed to dig deep for some ambition and found a little. I coaxed The Kid into helping and we spent the better part of the morning photographing finished projects. So now I just have to get them written now. Today’s reveal is actually two pieces. Once again, I have reverted back to my other signature painting style in five or six shades of pink. It seems to be a style that sells easily and quickly and has a timeless sort of appeal. What little girl wouldn’t love to be surrounded in a sea of pink? It started with the acquisition of an old headboard and foot board. I originally planned to turn it into one of those benches that are so popular, but once I started looking it over, I realized what solid pieces these were and how beautiful they could become. I hunted for sideboards and found a pair, but wasn’t until they were primed did I realize that they had the wrong connecting hardware. Back to the hunt. I actually had to place a “wanted” ad for the pieces specifically asking for the right hardware. Who knew that there were more than one design? 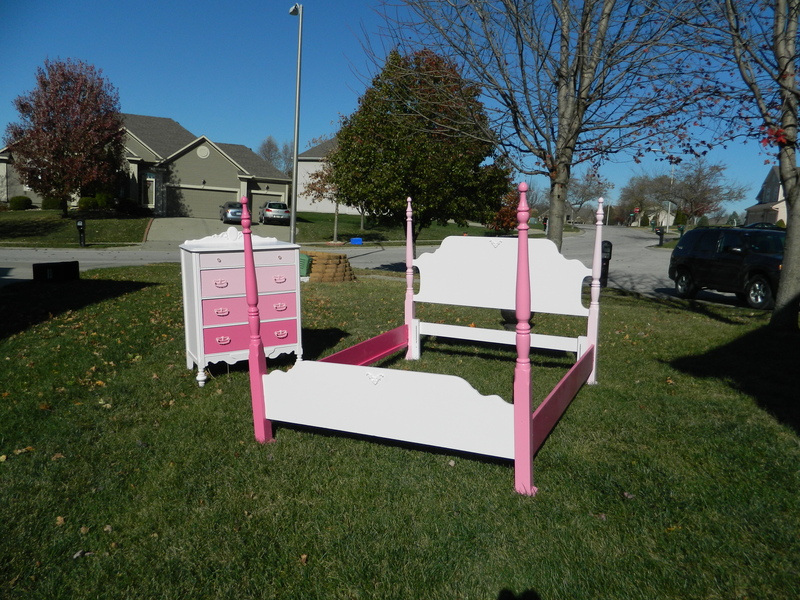 I finally did find the pieces I needed – along with another headboard and foot board. I almost didn’t want to have to deconstruct the side boards, but they were in pretty rough shape. 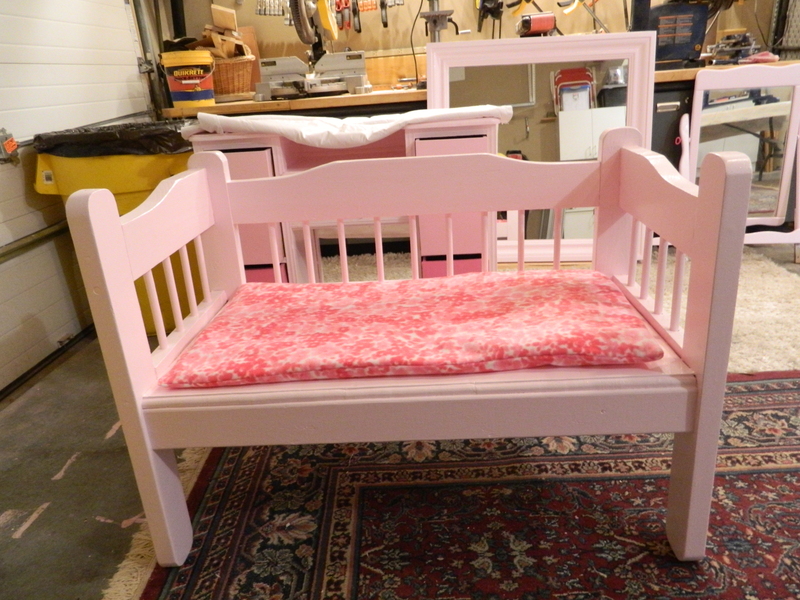 I am planning to use the head and foot boards to make that originally planned bench seat. 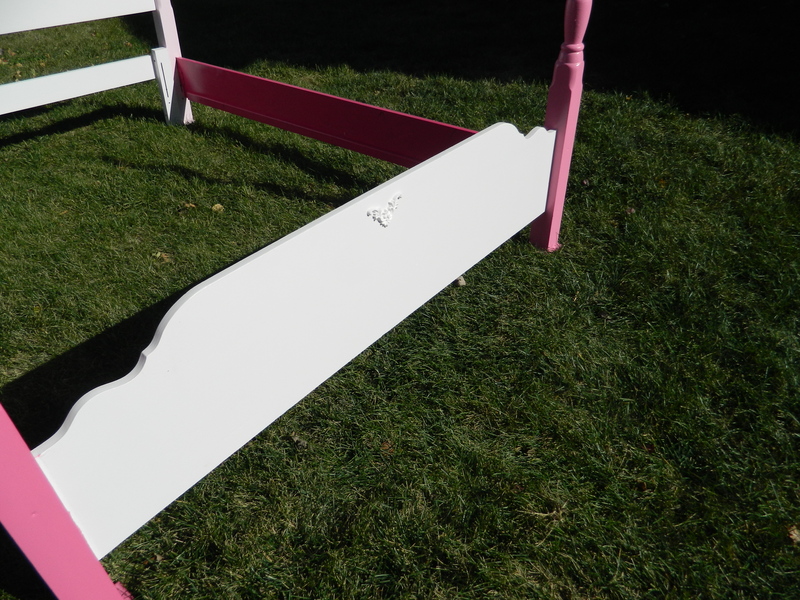 Following the primer, the base sections of the headboard was painted in the standard base color… the pink in its lightest hue. 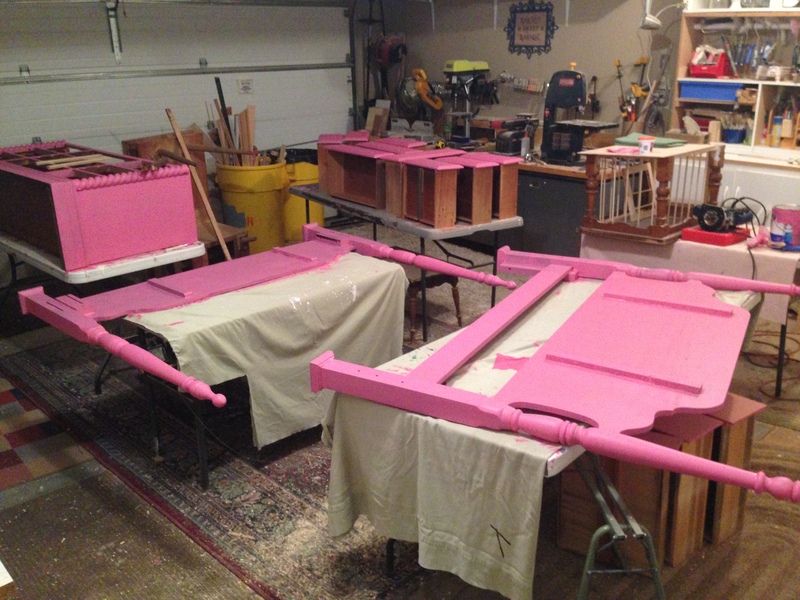 Then it was on to painstakingly hand painting each post a different shade of pink. The fifth and darkest shade was reserved for the side boards. I had specifically purchased appliqués to use on the both the headboard and foot board, the wide expanse of plain color seemed a bit too plain for me. The appliqués when arrived were a bit smaller than anticipated, apparently I was thinking inches but they were actually centimeters, but I opted to use them anyway. I like the way they turned out to be ‘dainty’ in the end. 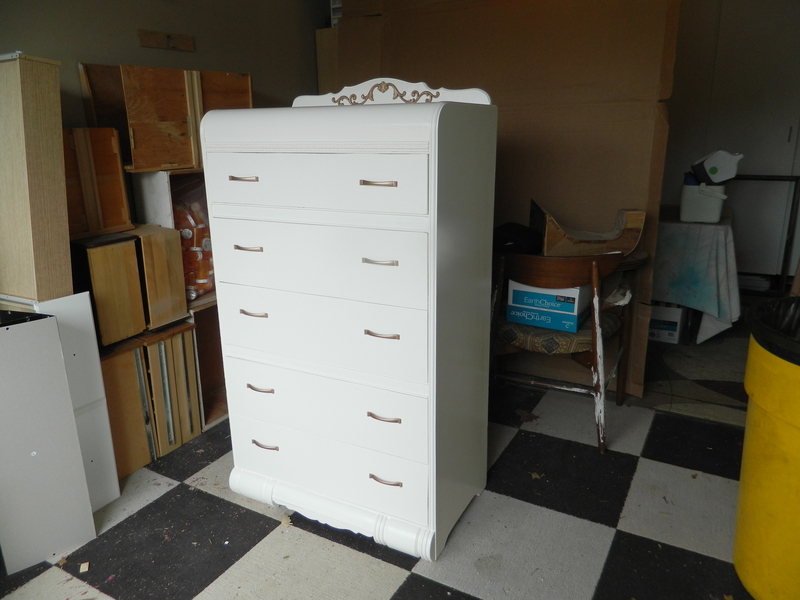 The matching dresser was a great accidental find and apparently I was so excited that I forgot to take any pictures of it before working on it. It was found in an abandoned farm house and had a rather extended family of mice living in the drawers. It had some water damage to the drawers as well and it took a lot of sanding, gluing and strengthening to bring this piece back to its original glory. Originally, the dresser had wood wheels, but water, weather and time had degraded them past saving, so they were simply removed. I love the idea of how tall this piece initially stood. I sanded every surface, including the drawer sides and bottoms and it was almost like building from scratch considering the amount of glue that was used to put it back together. 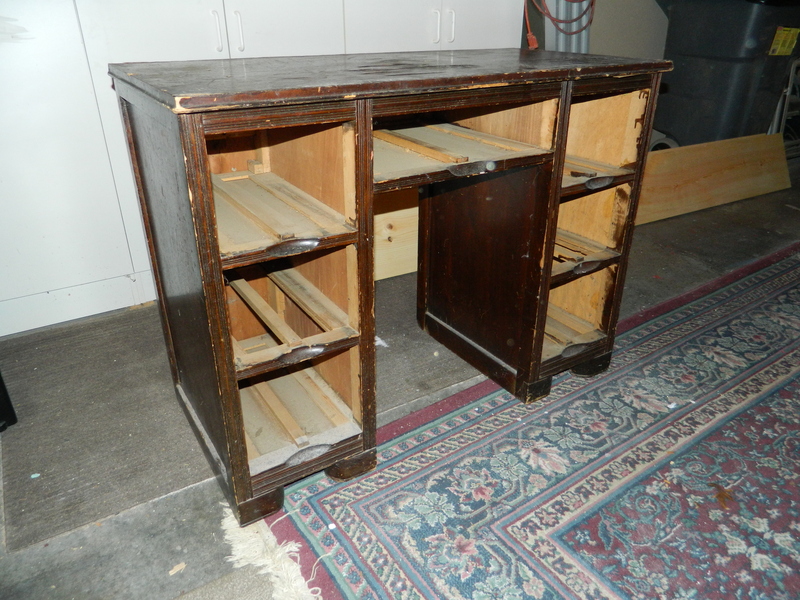 A lot of love and sweat went into restoring this piece. I think that is why I opted to use the pink ombré paint on the dresser. Its such a classic look that I knew it was the right decision. 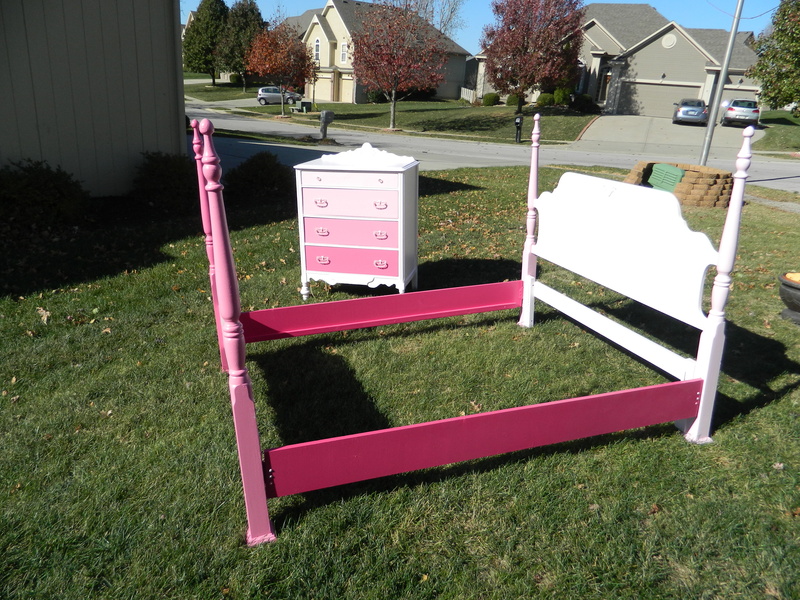 The bed and the dresser… note the styles really compliment each other without being an exact match. Both have those charming appliqués which are just the icing on these cakes! 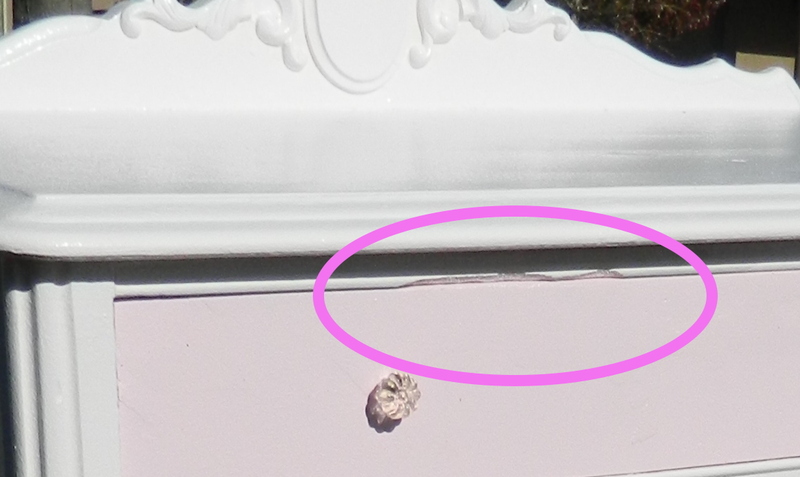 A little tough to see but the same appliqué on the headboard also appears in the same place on the foot board. The great design of the bed frame is that it is adjustable for both a full and a queen sized mattress without any work, other than moving the side boards to the separate set of slots. A shot of the foot board appliqué. 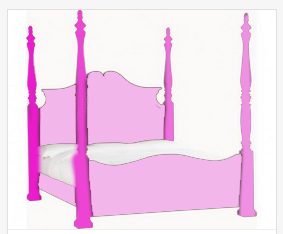 The lighter two colors of pink were used on the posts on the foot board and the two lighter on the headboard posts. 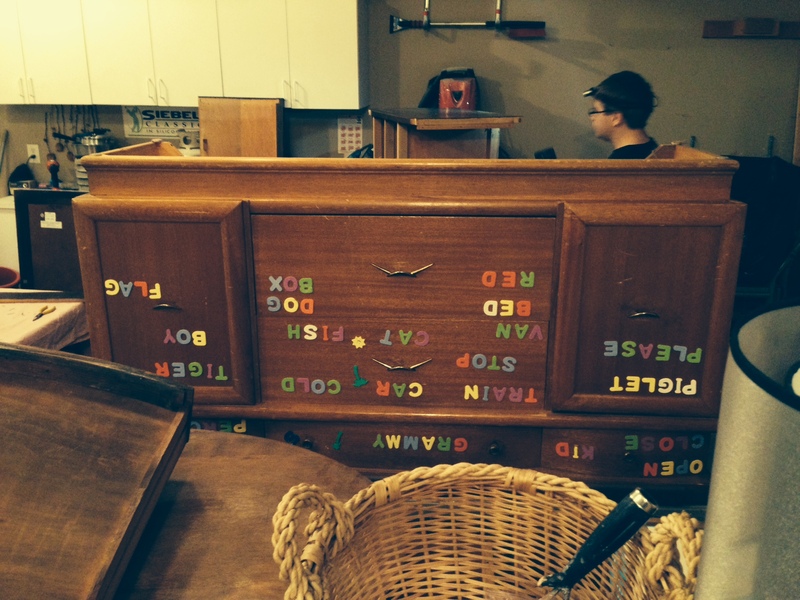 The sideboards have the darkest color. I sometimes wished that I had a daughter that I could have spoiled with this type of bedroom furnishings. 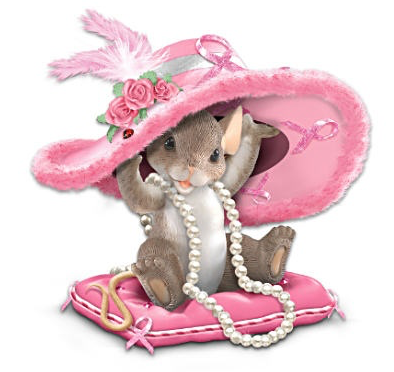 Perhaps she would have been more like me growing up and be a tomboy and hated everything pink (like me!). I love being able to provide this to some other lucky little girl. I can see this being a very nice Christmas present! Here it is stored and waiting delivery! A few additional photos. It was a beautiful day here in the Midwest, with great sunshine. Felt great to get these photos taken! 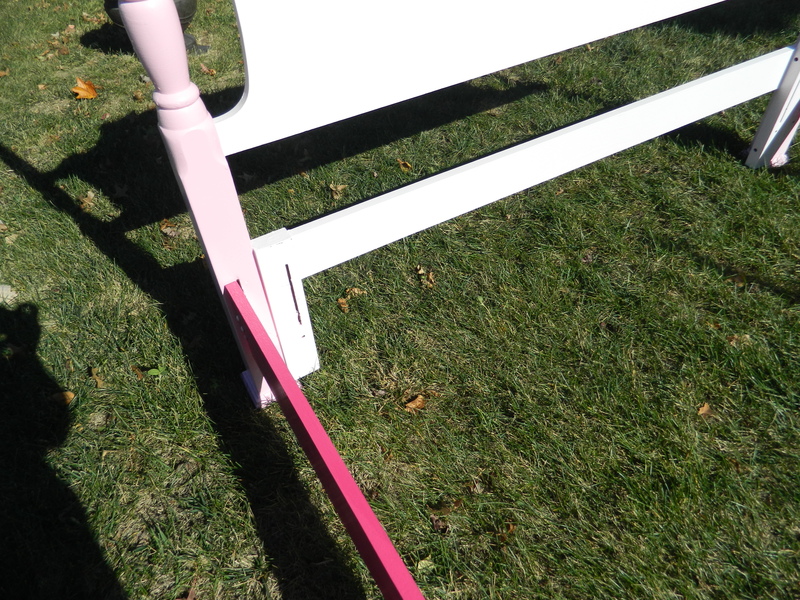 I used hardware that I had salvaged from a previous piece and painted light pink. 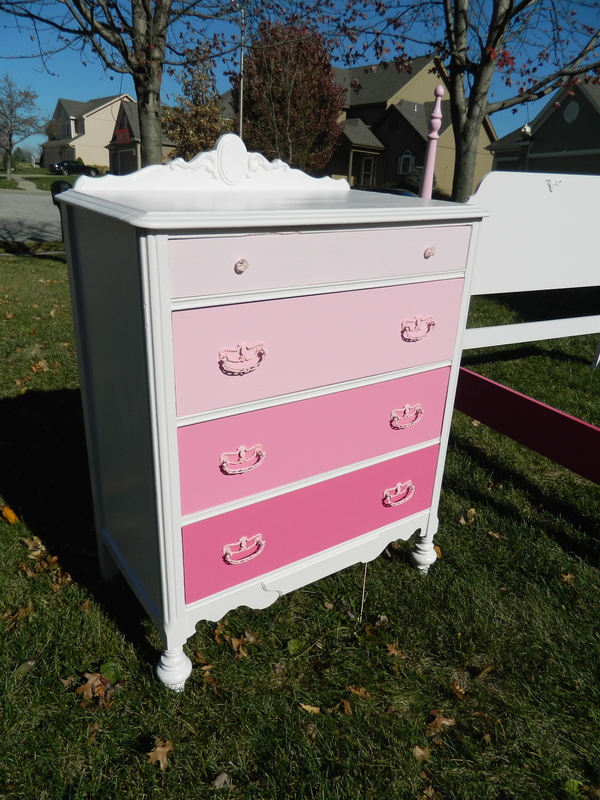 The top drawer received two glass knobs that had just the slightest pink hue to them. Perfect jewelry to this wonderful piece. On Second Thought, the First Thought is Usually Right! In my last post I showed you a neat little way to store your bits and baubles. 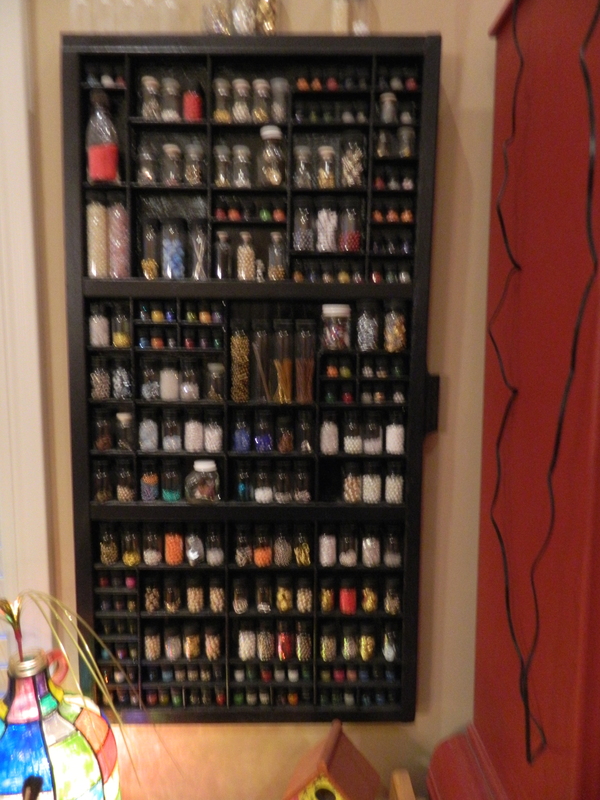 At the very end, I mentioned that I considered adding elastic bands across the front of each shelf. Well, in tidying up before heading to bed last night, I barely tapped the edge of the cabinet and… well, you can see the result! I guess that “might” has turned into a “definitely” be adding it! Once is quite enough of picking up those bottles! Saturday, I started work on painting the six chairs for the dining table. I had spray painted them white as a primer and had initially wanted to continue with spray painting with the final red color. But after spending the better part of an afternoon working through five cans of paint, I am less than enthusiastic about how it is turning out. For whatever reason, the coverage is not as good and in the process of trying to get good coverage, I am getting drips and too heavy coats. Not to mention that the overspray coated me such that it looked like I was sunburned and took a bit of scrubbing to get it all off. I had to wipe down areas on at least four of the six chairs, which then required re-priming. Sigh. This set me back a bit. Which is why I decided to take the day off from working on it today. Just wanted to clear my head and rethink my next steps. Instead, I’ve been working on something fun and relaxing and watching old movies. Hope y’all have had a great weekend too! Although today was one of those laid back kind of days. I did manage to finish one project and continue making strides on another one. I had shown you the progress on this dresser previously. I picked it up from CraigsList for a whopping twenty bucks, I couldn’t believe my good fortune. I had every intention of restoring this piece to its original glory, I had enough old veneer to replace the few places that were missing. I was so excited about starting work on this one. That excitement soon turned to sadness, as I realized that this piece was not to be. As I started working on the drawers, lifting edges to squirt glue between the pieces, large chunks of veneer just came off in my hands. As I continued trying to re-glue, more and more pieces would loosen and fall off in big pieces. As I continued, I realized that all of the drawers were in the same shape. So, I used the opportunity to harvest the veneer for future projects. Fast forward to its completion. A solid layer of primer and three coats of semi-gloss latex paint in a sweet color called “Toasted Marshmallow”. I mean, that even sounds like it would be sweet to eat! The Kid put the handles on this morning, and we moved it out into the garage and took photos. I love the way it turned out even if it meant that I couldn’t restore it. This is one of those pieces that I wished I could keep. I find that more and more I am more than happy with the way these pieces are turning out. I added the little scroll at the top of the dresser, the original one had a small ornamental mirror. It was chipped on one corner and show some real age. The applique was painted the same color as the handles. I just love that shimmer! This has been an end to a great week. Not only did I finish a bunch of pieces (and start a few more), but sold almost all of what was ready! Yay! Now I have a small foundation to start looking for the next projects. If you’ve read or followed my blog at all, you will probably have figured out by this point that I don’t do any one thing for long. It isn’t that I get bored, its that I am always wanting to try more and new things and different and better ways to do the things I do already. And sometimes it is about timing, when I get materials or furniture or inspiration! So, there has been a project I have been working on for a while. These are the projects I really like, that take a while and some attention, but don’t last too long and are always useful – either to keep or to sell. I did a similar pieces a while back, but I am not sure I did a write-up. So, I will make sure I’ve covered all the bases with this one. The first one was black, but this was is my signature red – what I call “Kitchenaid Red”. It all started with finding a printer drawer online. The person selling was only asking $15 and was close to me, so I bought it. I removed a few dividers, otherwise I would end up with too many very small sections. I primed it and then gave it a couple of coats of the red paint in a matte finish. It looks a bit on the orange-ish side in this photo, but it is the perfect red. Sorry about the lack of focus! Then, I set about filling it. Much like the black one, I felt it was the perfect way to store – yet display – the supplies that I use in a lot of the work that I do. I really want to do more jewelry making, I am just waiting for the inspiration. I did some way, way, way back, but haven’t done much since. 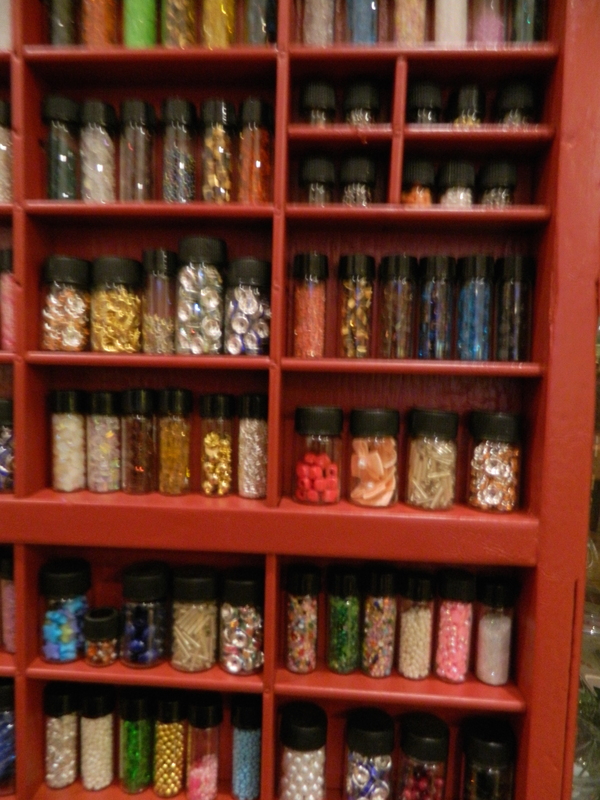 Well, other than collect pretty and sparkling beads and baubles. I stumbled onto these little glass bottles a while back when I was making food for the American Girl dollhouse. I can’t seem to locate a photo at this moment, but we made jars of pickles and jellies and jams and peanut butter, even spice bottles in a rack! I found them on eBay and you can find bottles of every height and width – some with crew tops, or corks or droppers. I just watched for a good time to purchase an assortment and then I turned to filling them. 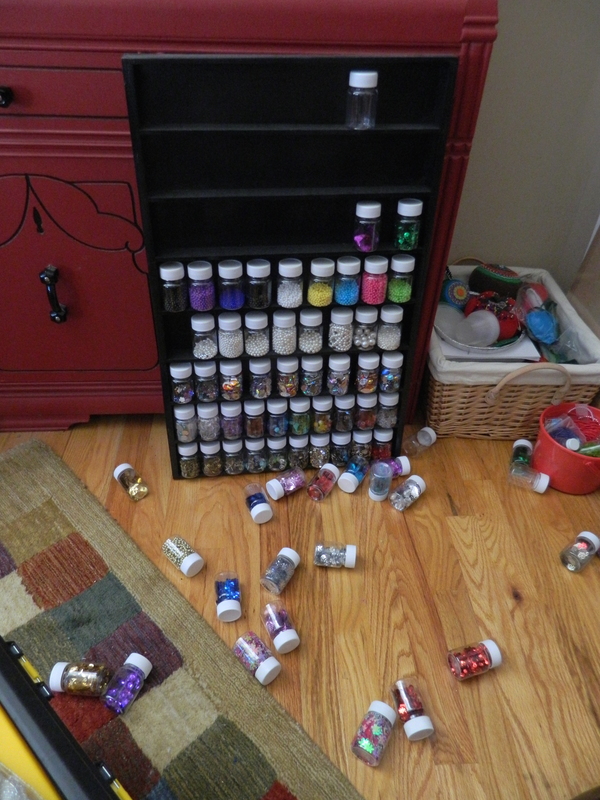 Originally, with the first drawer, it was to store and organize what I already had. But this time, I had little left still be to stored. 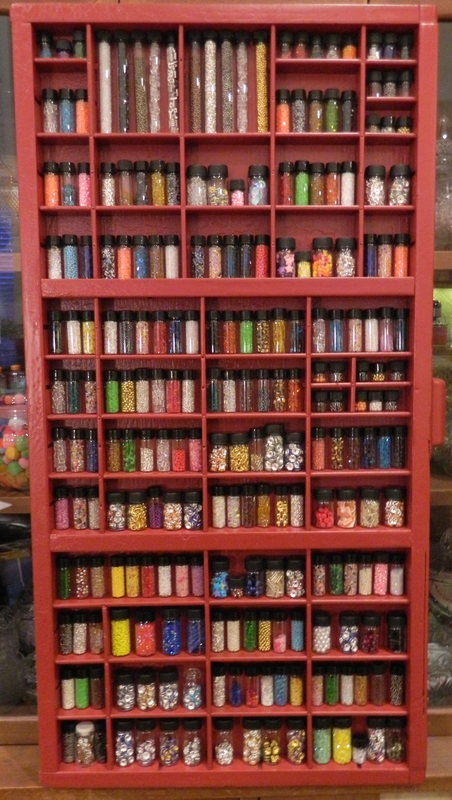 So, I turned to a little sneaky little way that I discovered how to get great deals on beads and such on eBay. In the wee hours of the night, I search for “free shipping” and prices between $.01 and $.25 and “ending soonest” and then I sit and watch until they are down to 30 seconds and place a single bid. If I get it, great! If I don’t, I move on to the next auction. Now, most of these end of coming from China, so it can take a bit longer than what I would normally want to wait, but in this case, it is just fine. Little packages start being delivered between one and four weeks and it is always fun to get little surprises! So, then it is just a process of filing the bottles and then arranging them in the drawer. This is the fun part. 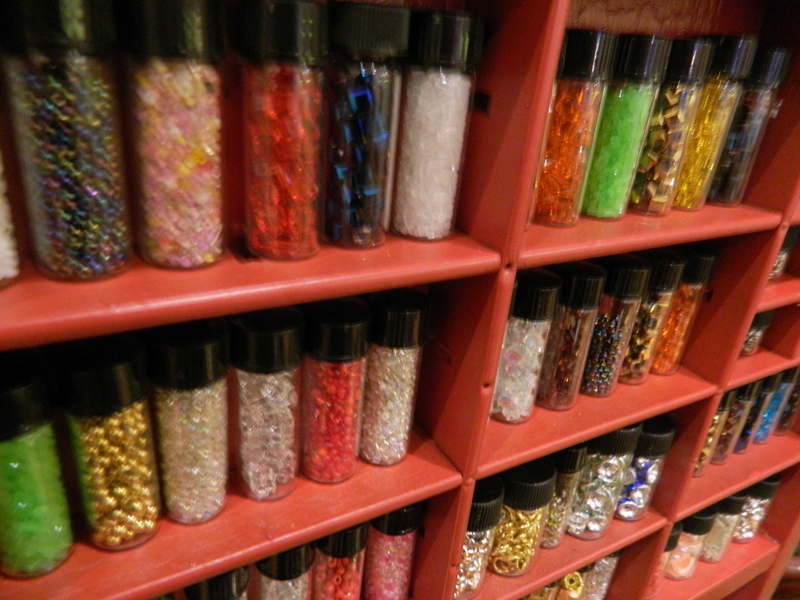 The colors and sizes and sparkles – its just fun! I also make a mental inventory of what I have. Once I do start jewelry designing, I will know what I already have! 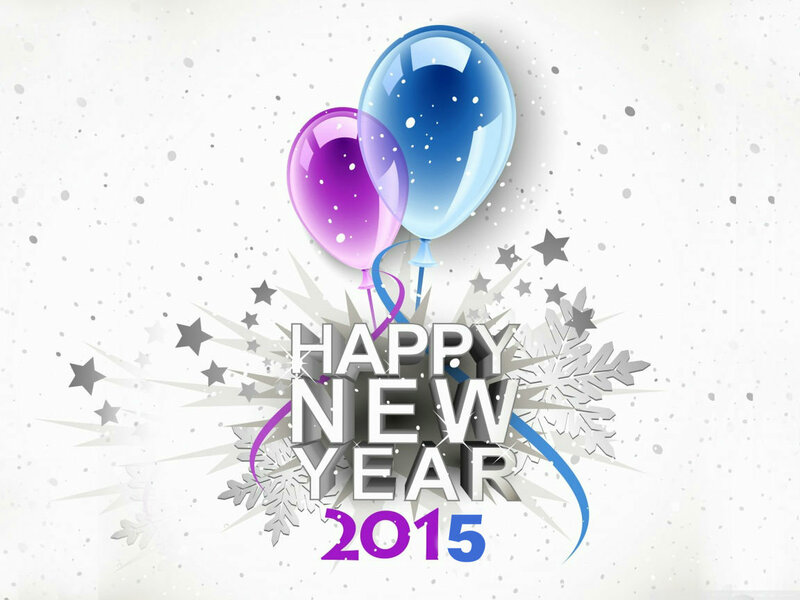 Look at all the sparkle and shine! Its like candies or chocolate, only better! I haven’t quite figured out where exactly to hang it… I had thought on the other side of the cabinet (opposite of the black one) if there is room. I’ve said this before, the problem with being crafty is finding enough places to display your works of art. Lots of things in the works, so keep coming back! I have wanted to do this for so long, I can’t even remember. I never seem to find the right headboard or footboards to suit my taste. 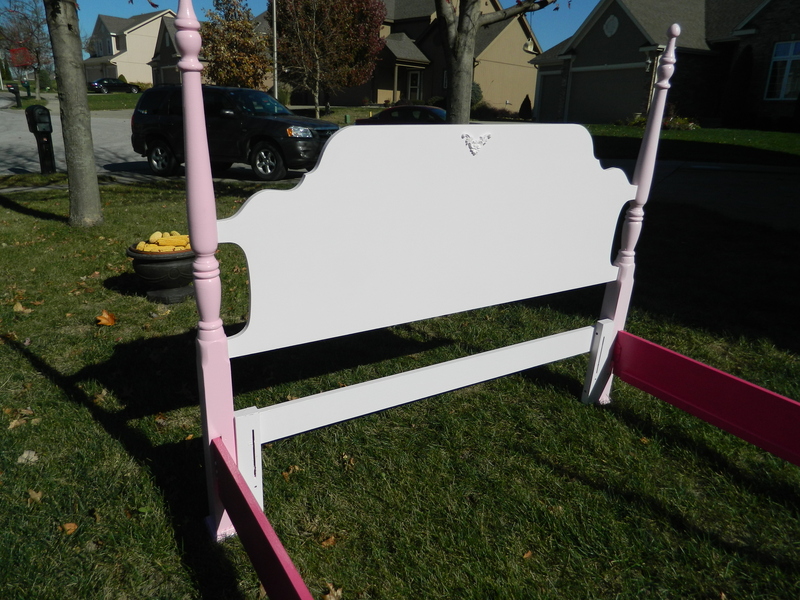 Recently in picking up pieces from Craigslist, these footboards were included in the pile (! ), so I opted to do a test run using them. It was easily assembled, with four screws for each side. We used a countersink bit so that the screw heads were well concealed. As this was quickly turning out to be child sized, I wanted it to be safe for little fingers. The Kid took the lead on this, God bless that kid. He added supports and then included the board for the seat. My suggestion of putting a smooth lip on the front of the seat was done by way of a router. It was then the usual process: primer and three coats of paint. Since we were working on a multitude of pink projects, it just made sense to include this one as well. I wanted to add a big cushy pad, but a 39 inch piece of foam was going to cost almost $40, so I went with a little thinner pad (using quilt batting) and a multi-pink colored piece of fleece. In the end, I think it came out okay, but the next project like this, I hope to have a little more fanciful head/foot boards. I’d like to include on in my master bedroom makeover. You cannot believe how many times The Kid suggested that we junk this piece or throw it away. 🙂 In the rush of things, I again, forgot to take the ‘before’ photo. This is almost it, although I had already removed the drawers and started working on them. 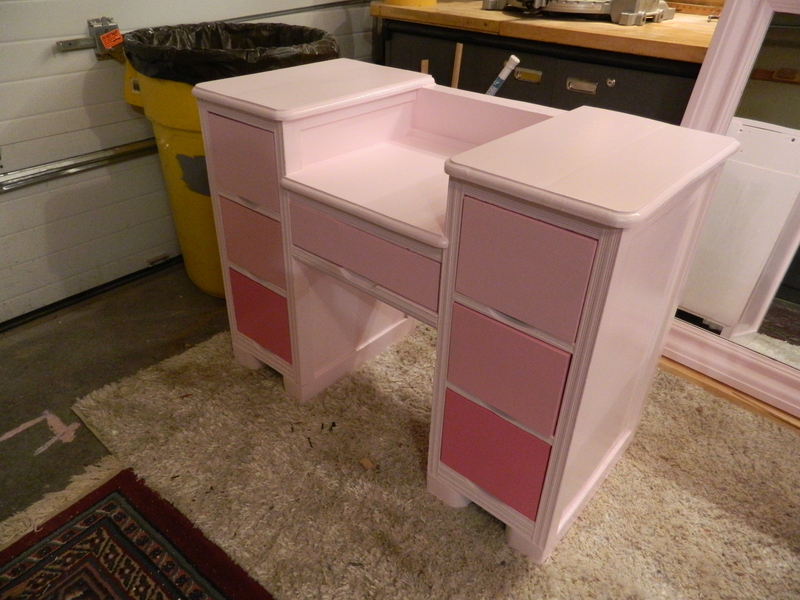 The idea from the get-go was to turn this little desk into a vanity. It would entail simply moving the middle drawer down a few inches. It was pretty easy, these older pieces were assembled with minimal glue. Once the top was removed, it only took removing four little screws and it all came apart. With a few well placed holes, the whole drawer unit went right back into the lowered space. Using the existing desktop, a piece was cut to fit and placed. Edges were given rounded edges – much like the bench above. The remaining sections of the top were also attached and a brace across the back to help stabilize it and make it more sturdy. Then, the usual, the 3 P’s: patching, primer and paint! As a side note, the drawers all required new fronts. Once I started sanding them, the veneer had become so thin, they simply disappeared! A piece of paintable veneer was applied to each drawers front with glue, sanded to make the edges even before prep for painting. I have this little vanity mirror picked up in my Craigslist travels. 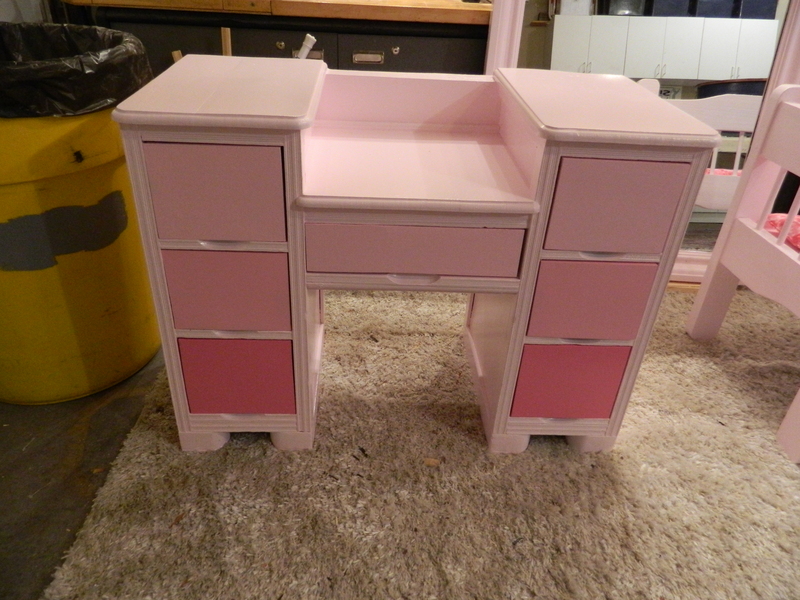 It doesn’t exactly match the style of the vanity, but with the paint style, it could. I will offer it to whomever is interested in the vanity at no extra charge, so that the vanity does have a mirror. Either way, I think it would be so cure in a little girl’s room! 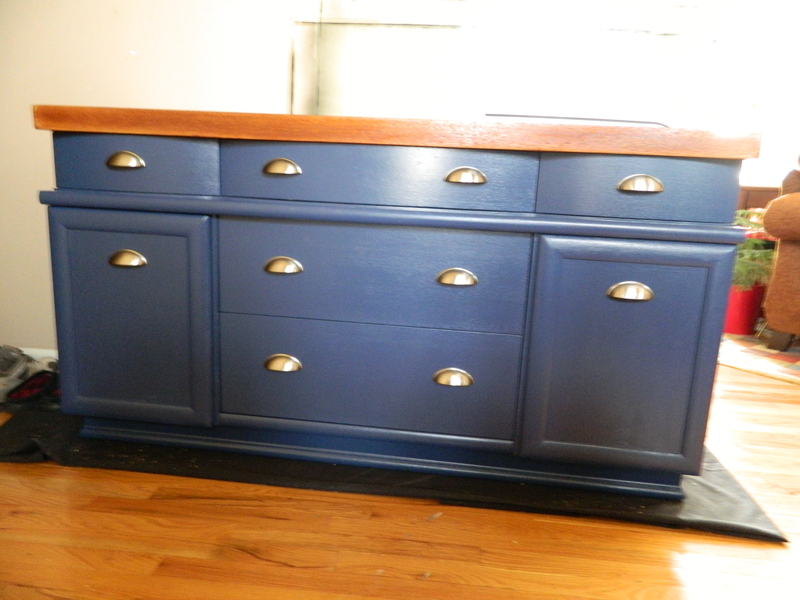 Last year, I had a young couple purchase an ombré dresser in blue for their newborn son. 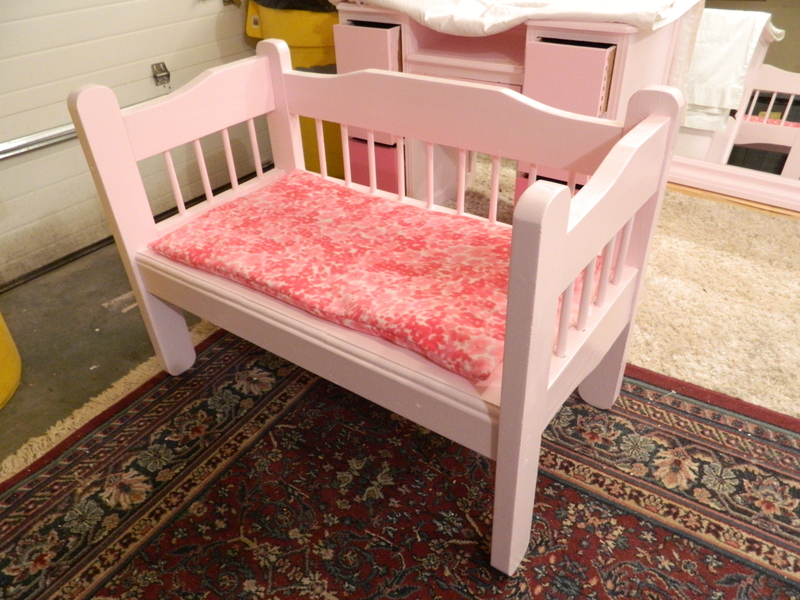 She contacted me recently for another in pink for the upcoming arrival of her baby girl! 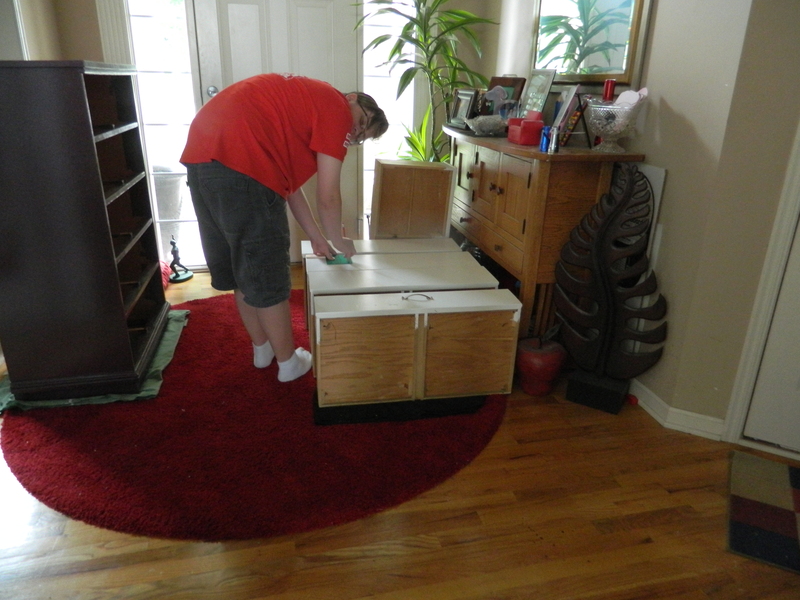 I was able to procure a very nice chest of drawers – manufactured by Broyhill – and although it isn’t exactly the quality of furniture I am used to working on – but The Kid put some extra care into beefing up the drawers, making sure they slide well. 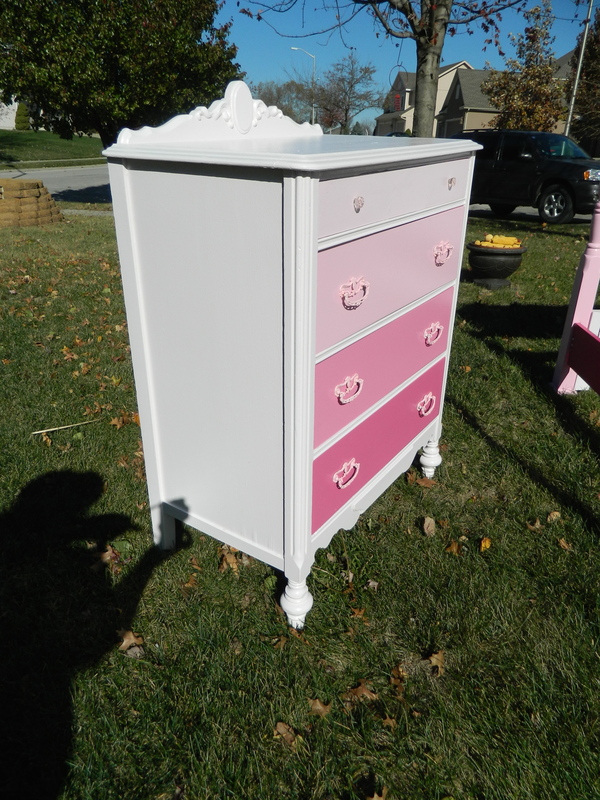 Normally, I would paint the cabinet in the blush pink, but the request was made to paint it white instead. 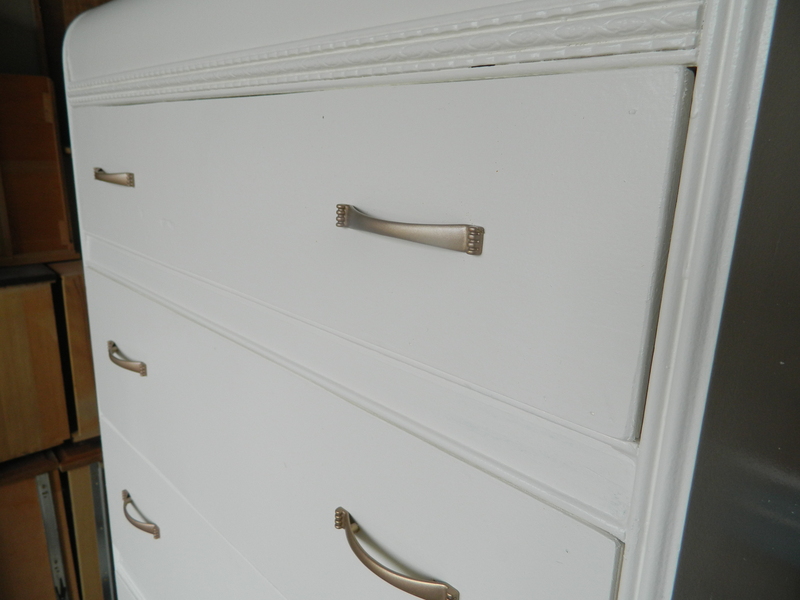 I love the new white paint that I have been using, it has a really high gloss finish – what is called ‘mirror finish’. I absolutely love it! 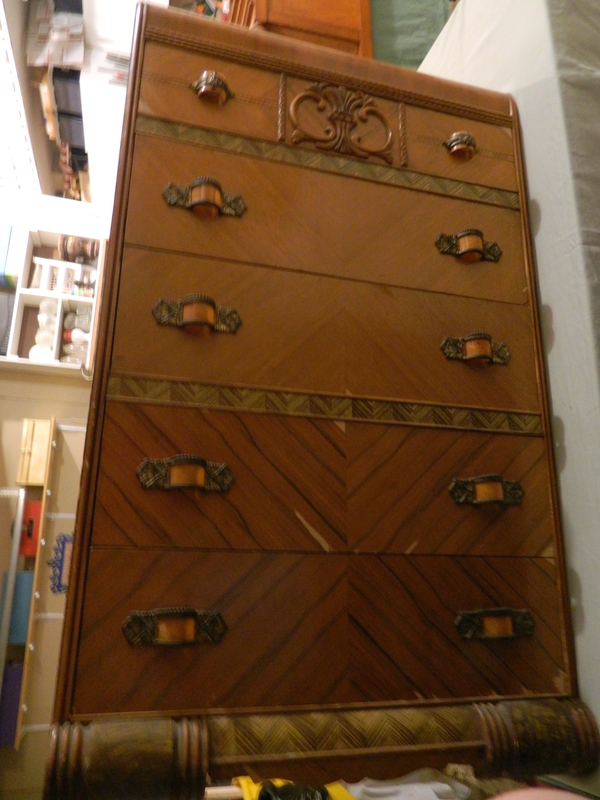 I keep going back and forth on that little ribbon that bounces playfully between the second and third drawers. I want to paint it some color of pink, but not sure which. And there is another part of me that just likes it like it is, more subtle. It could easily be done at any time, but easily undone. So we’ll see! A while back, I purchased three fantastic large mirrors regularly price at $200 for a mere $15, due to the frames being all scratched and dinged. 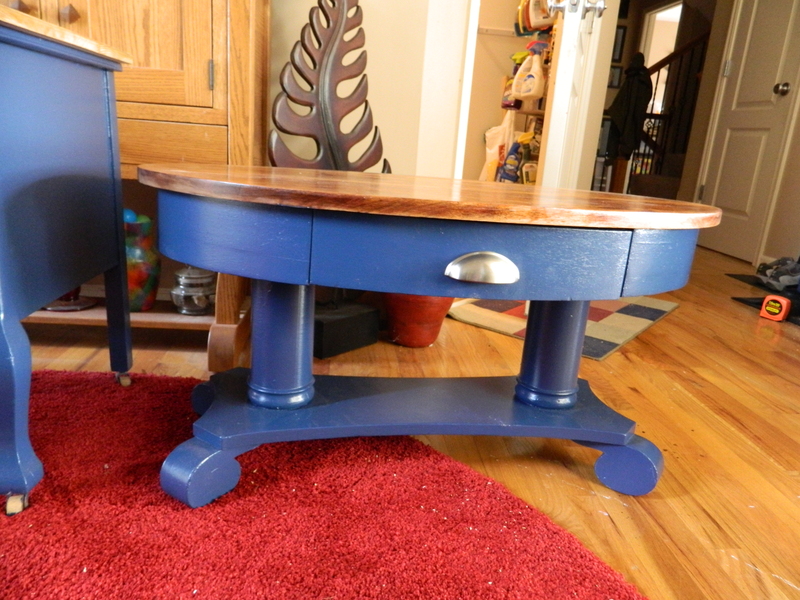 Two were painted and shipped out with their respective victrola upcycles, but a third one remained unclaimed. 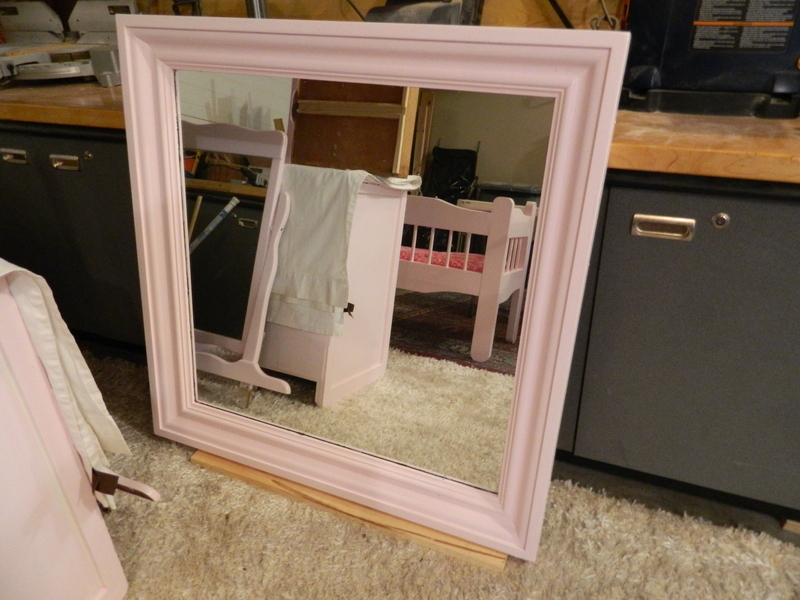 I thought with all the pink pieces being completed, any one of them could use a big beautiful mirror! Whew! So that does it for all the pink pieces. Tomorrow, the last day of 2014, will be a quick rundown of the ‘blue’ pieces. Thanks for hanging in to the very end!